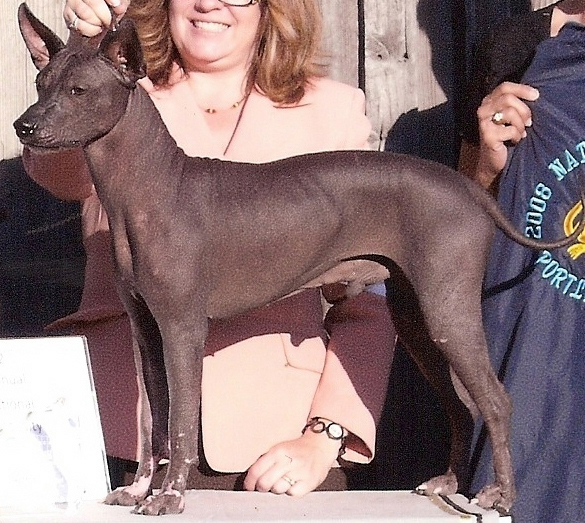 A uniquely New World breed, the Xoloitzcuintli stands out for being hairless, although there is a coated variety. 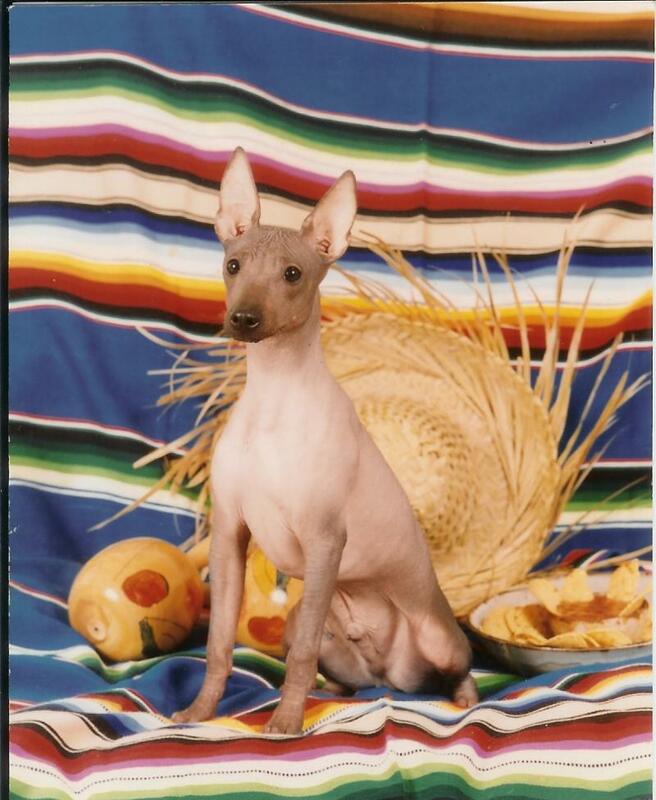 The Xoloitzcuintli was one of the earliest breeds to be added to the American Kennel Club studbook – in 1887 under the name “Mexican Hairless”. This is a robust and healthy breed that evolved in the primitive jungles of Colima, Mexico. Archaeological evidence has been found in the tombs of the Colima, Mayan, Toltec, Zapoteca, and Aztec Indians dating the breed to over 3500 years ago. Long regarded as guardians and protectors, the indigenous peoples believed that the Xolo would safeguard the home from evil spirits as well as intruders. In ancient times the Xolos were often sacrificed and then buried with their owners to act as guide to the soul on its journey to the underworld. These dogs were considered a great delicacy, and were consumed for sacrificial ceremonies – including marriages and funerals. The name Xoloitzcuintli (pronounced “sho-low-itz-queent-li”) is derived from the name of the Aztec god Xolotl and Itzcuintli, the Aztec word for dog. (Xolo owners are frequently stopped and find themselves explaining not just the breed – but teaching people how to pronounce the name!) Indigenous peoples believed them to have healing powers and they were thought to bring relief from a vast variety of ailments. That belief still survives today in the rural parts of Mexico. One of the reasons being that they feel warm to the touch – and can actually act as a “hot water bottle”. The breed comes in three sizes and two coat varieties (both born in the same litter), thus providing prospective owners with many choices. At 18” to 23” at the shoulder, the Standard is the largest size. That size makes for an impressive guardian of the home and family. The Miniature is 14” to 18” – this size is often known as the “clowns” of the breed. As a family pet, they are an ideal size – large enough to play with the children, small enough to be picked up when convenient and fit comfortably on a sofa with the family. The Toy at 10” to 14” is the perfect size for apartment dwellers and those wanting a lapdog. People with allergies can often live comfortably with a Xolo – although each person is different and it must be considered on a case-by-case basis. Because of their keen intellect, ease of care, and eye-catching primitive appearance, the Xolo is gaining more popularity as a choice for a family pet in the United States. All three sizes exhibit the typical temperament of a working breed. They are often reserved and wary of strangers, but should never be timid or aggressive. They generally bond strongly with their owners, and while friendly will not be as affectionate with strangers. Xolos are very clean and are often seen grooming themselves like a cat, and are easy to housebreak. The two varieties are the hairless and the coated. 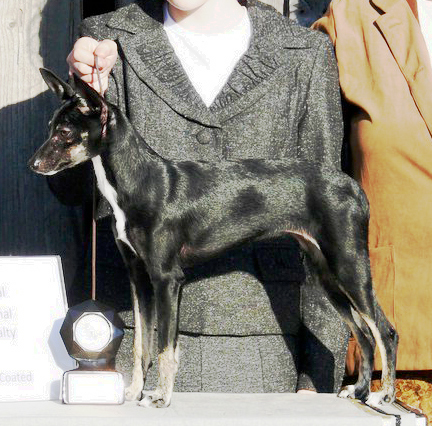 Solid dark colors are preferred in the show ring, but it is not unusual to see a large selection of colors in both varieties The hairless may have short coarse hair on the head, tail and feet, while the coated will be covered in a short sleek tight fitting coat. Xolo skin is actually a hide – thick, protective and resistant to injury. They exude an oil that protects them from the sun and from insects. Incomplete dentition is common in the hairless variety but it never interferes with what is usually a very healthy appetite! Often you will find the primitive “tusks” that jut forward instead of normal canines – believed to be a result of the hairless gene. Coated Xolos should have a full mouth of teeth. Because they are a hardy primitive breed, they don’t yet have some of the health problems common in more domestic breeds. Xolos are natural free whelpers and excellent mothers. The puppies don’t look much like their parents when they’re born – they have shorter faces, wrinkly skin, dropped ears and seem a bit on the short-legged side. One of the joys of being a breeder is getting to watch them change into the lean, elegant adult they will become. The average life span of a Xolo is 14-17 years (approximately). This is truly a “wash and wear” breed with few health problems if fed a quality food and given exercise, as well as appropriate preventive medical care; prospective buyers should be aware that the first year of a hairless Xolo’s life they may suffer from adolescent acne. Their nails do need to be either filed or cut – although some Xolos may be able to wear their nails down if they get enough running on a hard surface. The teeth need to be cleaned – either by regular brushing at home – or periodic dental cleaning by a vet. The breed was first recognized by the Mexican Kennel Club (FCM) on May 1st, 1956; prior to that the breed was only known to the secluded Indian tribes in the remote parts of Mexico and Central America. The Archduchess Felix of Austria, better known as the Countess Lascelles de Premio Real, was the driving force behind the 1955 expedition led by Norman Pelham Wright into the Colima jungle in order to find the dogs and reintroduce them via an organized breeding program. 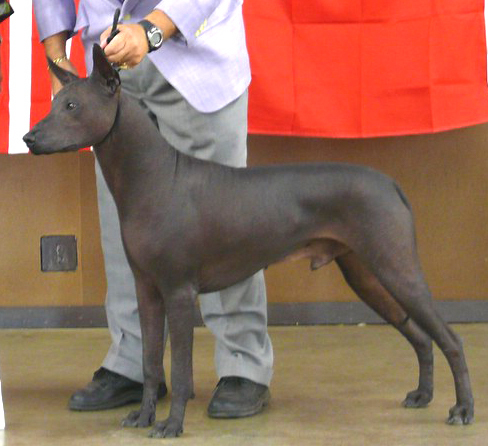 The Xoloitzcuintli has now been designated as the Offical Dog of Mexico and is recognized by all FCI countries, as well as the US and Canada. The Kennel Club of Great Britain registers and allows Xolos to be shown – but they are still known as “Mexican Hairless”. . . . The Tijuana Xoloitzcuintle soccer team (with Xolos as team mascots) proudly display a beautiful Xolo head on their logo (bred by the world-famous Caliente Kennel). On December 2, 2012, the Xolos (as they are known) became champions of the Liga MX, the top level of the Mexican football league system. The success of the team has done more to promote the Xolo in the public eye than all of the years of work done by the Parent Club in both countries. A living symbol of Mexico's ancient civilizations, the Xoloitzcuintli has much to offer as a member of the family. The Xolo (as it Is abbreviated) comes in three sizes, two coat types, and an infinite variety of personalities. As with most primitive breeds, their intelligence allows them to interact with people in a near-human type of friendship. Grooming is truly minimal for the Xolo. Hairless dogs need regular bathing, and the application of moisturizing lotions will keep the skin in good condition. Like the Chinese Crested, Xolos darken and tan with exposure to the sun. They too are prone to "adolescent acne" as they mature, although keeping the dog and their surroundings clean and not "picking" eruptions will help that stage to pass with a limited amount of distress for all concerned. Unlike the Chinese Crested, Xolo skin can be likened to "hide" - resilient and tough enough to withstand scrapes and scratches with no damage. The first of the three sizes is Standard. At 18 to 23 inches at the shoulder, they are impressive - a very effective watchdog by their appearance, emphasized by a thundering bark. The miniatures range in size from 14 to 18 inches - large enough to accompany their owners on a long distance walk, and yet curl up comfortably in a lap at home. Although rather small, 10 to 14 inches, the Toy is nonetheless all Xolo. As independent and intelligent as their larger counterparts, Toy Xolos are entertaining companions who can travel comfortably under the seat in an airplane or be carried in their owner's arms. The coated Xolo (the ones with hair) are sleek, attractive dogs - easy to groom, with a shiny, close-fitting, short coat. Xolos tend to bond strongly with one family member, although they will connect with and love the whole family - including other pets. Both the hairless and the coated may be appropriate for people with allergies - although it depends on the individual. 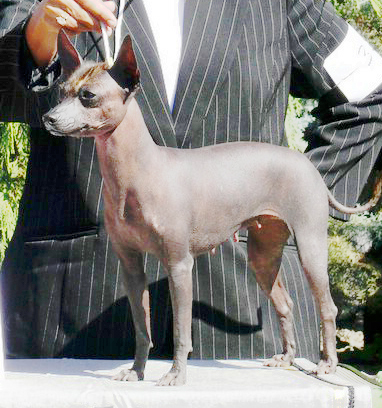 They may not be a breed for everyone, but Xolo owners who fall in love with this unique breed may find other breeds a bit too ordinary after life with a Xoloitzcuintli. 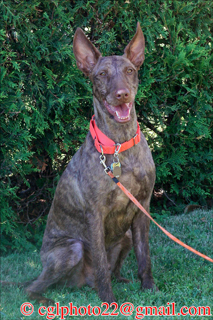 One of the newest breeds being considered for people who suffer from allergies and asthma is the Xoloitzcuintli. A primitive breed that dates back to the time of the Mayan empire, this loyal and intelligent breed is becoming a popular choice for many who suffer from pet-related allergies. Long believed to possess healing powers by the indigenous peoples of Mexico, Xolos seem to be “magical” for many. The truth is that they are a handful to live with, and don’t possess any real healing qualities other than love, comfort and a source of body heat. For every person who asks me if a Xolo will work for them, I counter with these questions: Are you allergic to fur or canine saliva, and do you have time to take on a full-time commitment to a dog? Xolos have all of the same qualities as other breeds of dog. Their saliva, sparse hair on their heads and feet, and skin all produce the same irritant that bother some allergy sufferers. What makes them an ideal dog for people who can tolerate living with them is that they are a “wash and wear” type dog. Many owners appreciate the fact that you can wipe a Xolo down with a damp cloth. This helps reduce the dead skin cells, and remove any outside pollen from weeds and grass. The skin (hide) of these dogs exudes an oil that protects the dog’s skin and reduces the dry dander that may constitute a large portion of the allergens. Every new pet owner must be able to determine what it is that causes their reaction to an animal. Many people just cannot tolerate living with any dog. For the lucky few, there are certain breeds that will work well. For a select group, the Xolo is a really great choice. It is really important to know the drawbacks of each breed. Xolos are active, inquisitive and destructive as puppies. They are a primitive breed, and require intense socializing as they mature. Xolos tend to be guard dogs, so you can never take them for granted. They require consistent training; you must be able to provide enough room and exercise, especially for young dogs, or they will keep themselves busy by destroying your belongings. The first year in a young Xolo’s life can be a rough one for both puppy and owner. 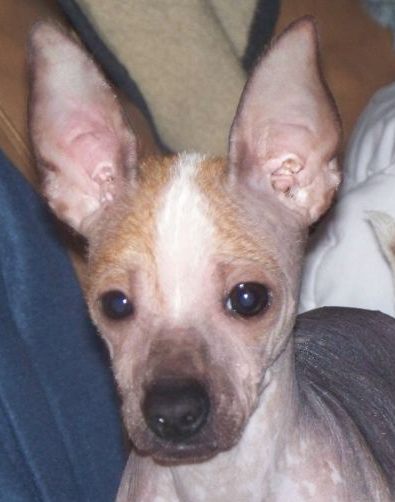 This breed is a natural adaptation with a hide instead of skin, as in other hairless breeds. 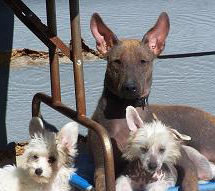 The correct Xoloitzcuintli does NOT need sunscreen, or clothing for protection. The hide matures throughout the first year of the dog’s life – during which time some Xolos go through adolescent acne as the skin and the oil glands grow at different speeds. Sometimes the skin may appear to break out with blackheads – young pups may acquire the equivalent of cradle cap (a waxy buildup on parts of their body). At times the pups produce too much oil and take on a musty smell. A new owner must be ready, willing and able to deal with these outbreaks. For the right person Xolos make a wonderful addition to their family. The breed is relatively healthy and has a good lifespan. They are easy to train and are loyal companions. When bred with proper care, they make great family pets. The breed comes in three sizes and two varieties. There is a fully coated version of this breed, and if bred well has a short, tight flat coat that many with allergic issues can tolerate as well as the hairless counterpart. Remember that Standards, which range in size from over 18” up to and including 23” at the shoulder, are fairly tall and very strong; Miniatures, which are over 14” up to and including 18”, are very agile and active, requiring a lot of exercise; and Toys, which range from 10” up to an including 14” at the shoulder, are very inquisitive and you may find them on any counter in your home. All three sizes can climb and have a strong prey drive. My advice to everyone who is looking for a breed of dog that can work in your home is to get out and meet the dogs – spend time with your hands on them, and see how the adults live.